Eduardo Lorenzi is a Planner with experience in the Brazilian and Latam Markets who has led planning departments since 2008. He was nominated as Planner of the Year in 2011 and in 2015 (Caboré Award) and won the APP Award for Planner of the Year in 2013. Eduardo holds a Bachelor‘s Degree in Social Communication from ESPM and a Post-Graduate Degree in Business Administration from FGV. 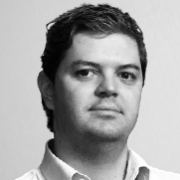 He has served as a Professor at the Miami Ad School and a member of the Effie Awards Brazil Jury.